North and South Korea agreed at high-level talks on Monday to hold their next summit meeting in September in Pyongyang, the South's Unification Ministry said. It would be the third summit meeting between South Korean President Moon Jae In and North Korean leader Kim Jong Un, and their first in either country's capital. Their two previous summits, on April 27 and May 26, were held at the border village of Panmunjeom in the Demilitarized Zone dividing the two Koreas. At the April summit, the countries agreed to meet again in fall in Pyongyang. The move to arrange another inter-Korea summit comes as U.S.-North Korean talks over the North's denuclearization remain stalled despite Kim's pledge to work toward the "complete denuclearization" of the Korean Peninsula. At Monday's talks, held at Panmunjeom, the officials also discussed ways to implement measures agreed in a joint declaration their leaders signed at their first summit in April, according to a joint statement released by the ministry. "Solving remaining problems between the North and the South is very important to improve the inter-Korean relationship and to carry out items for which we have set schedules," Ri Son Gwon, the North's chief delegate, said after the talks, according to a South Korean pool report. 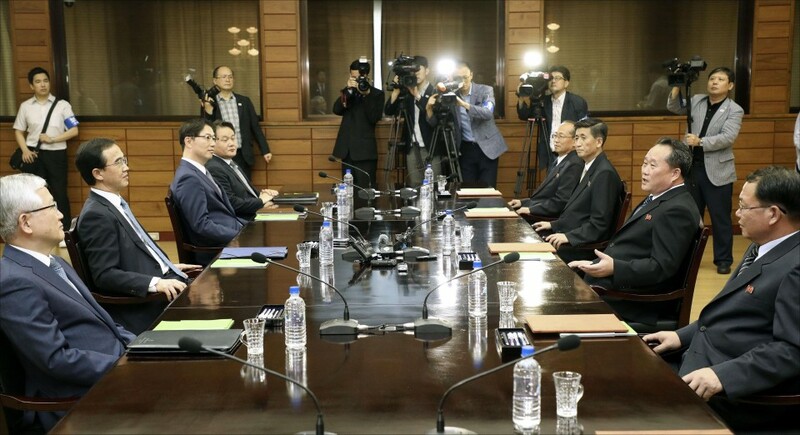 Unification Minister Cho Myoung Gyon, who led the South's delegation in the talks, told reporters after the meeting that the two sides agreed to have another inter-Korean summit as soon as they can, and that given "circumstances" in North Korea, they have decided to hold it in September. The talks, held at Tongilgak, a building on the northern side of the small enclave split by the Military Demarcation Line, were held from Monday morning with a third summit between the current leaders of the divided peninsula at the top of their agenda. Ri serves as head of the North's Committee for the Peaceful Reunification of the Fatherland. OPINION: North Korea's denuclearization was "wishful thinking"